The Cat. 5e/Cat. 6A RJ45 connector is arguably the most used interface in data communications. Based on this connector interface, Conec has designed a rugged, IP67 sealed, versatile connector system for Cat. 5e and Cat. 6A, that ensures reliable protection and the convenience of easily mating under the most difficult and harsh environments. The RJ45 connector is arguably the most used interface in data communications because in the industrial automation market, much of the upload and download activity that goes on in programming machines is done via Ethernet and/or laptop computer. Such connections can be plugged into a sealed RJ45 connected point-to-point, allowing for easy download of data without requiring machine shutdown. The ruggedized circular body of the Conec Cat 5e and Cat 6A RJ45’s housing is ideal for this, because it protects against exposure to any kind of abuse or ingress from dust, dirt or water. For industrial real-time-Ethernet, CONEC has developed an RJ45 connector type with a bayonet latching mechanism according to the IEC 61076-3-106 standard. This robust design with IP67 rating ensures reliable protection and easy connection under harsh environmental conditions. They are not intended for use under continuous pressure. In consideration of the broad range of ‘rained on’ definitions, the industry appears to have agreed to a ‘test of immersion for 30 minutes, at a depth of 1 metre, or the equivalent air test at 1.45 psi. That is the Qualification Test. (Protected against the effects of temporary immersion between 15cm and 1metre. Duration of test 30minutes). A socket connector with IP67 rating, bayonet coupling and protective cap is available for installation into equipment. It can be mounted on the front or rear side of an enclosure panel of up to 3.2 mm thickness and is available in three designs. Pre-assembled patch cables with IP67 rating in various lengths are available to interconnect panels and equipment. Working temperature : -40 to 85C. The existing product line of IP67 rated RJ45 and USB connectors featuring bayonet locking design in accordance with IEC61076-3-106 type 1 is now available with diecast housings. Compatibility between enclosures made with various materials is adhered to in accordance to IEC61076-3-106. 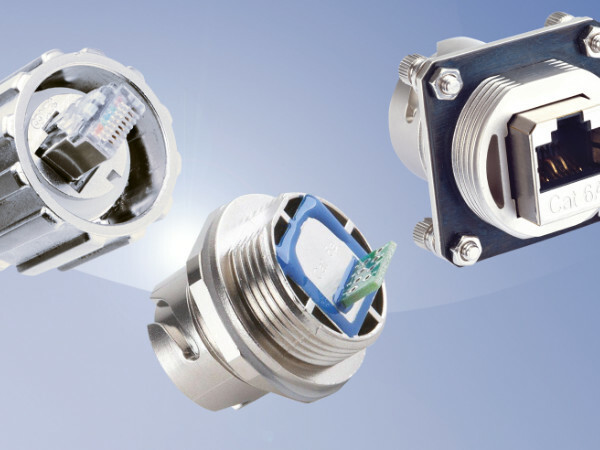 The latest variant to the range is a Square flange connector with a Cat5e and Cat6A performance for front and back panel mounting for thicknesses up to 3.2mm. The bayonet locking housing is made of nickel-plated die-cast zinc.